Phew. I feel like I accomplished something. I finished the center on Wednesday and added the borders over the weekend. I had a small mishap while sewing the last curved seam. I pinned the seam together with a pin every inch or so, to keep the curve, match the points and intersections. As I neared the center, carefully pulling pins as I got to them, I dropped one right into one of the screw holes to the right of the needle. It was as if it got sucked right in. I immediately stopped sewing, needle up, foot up and turned the machine off. After pulling the bobbin and case out I still couldn’t see it. I then tried, gently, leaning the machine forward and back, but still nothing. Well, it was early enough in the day that I could bring it over to my dealer. Thankfully the tech was there and he was able to take the free-arm cover off and retrieve the pin. They said it probably wouldn’t have hurt anything, but I wasn’t taking any chances. Back home I went to finish the seam. But, before I started sewing I put a small sticky dot over the hole, just in case. The Kona fabrics came in the post Thursday, yay! 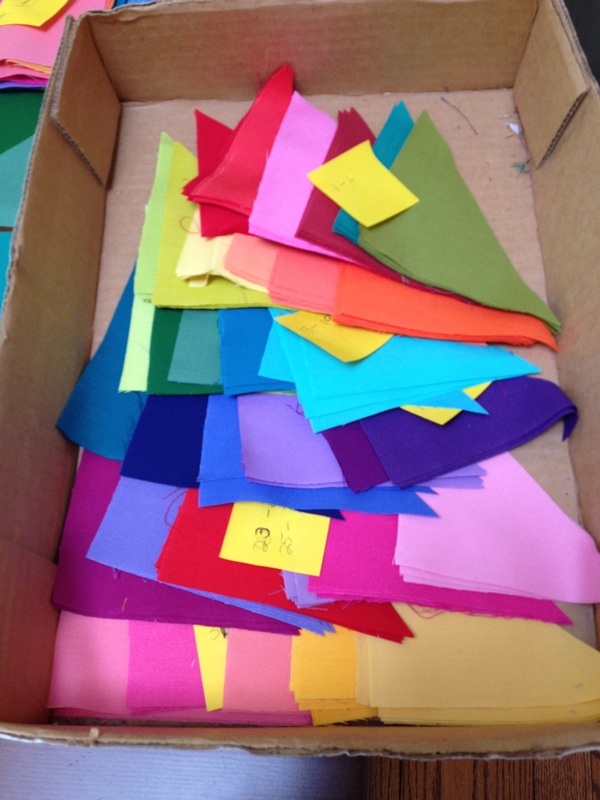 I got the 5 inch wide rolls, so cutting squares was simple, then I cut them into triangles. The difficult part was laying them all out on the table in proper sequence, there are 36 different colors. The pattern was a graph/map with numbers and such. I managed to get lost only once, but I found using a sticky note on the graph to keep my place helped. 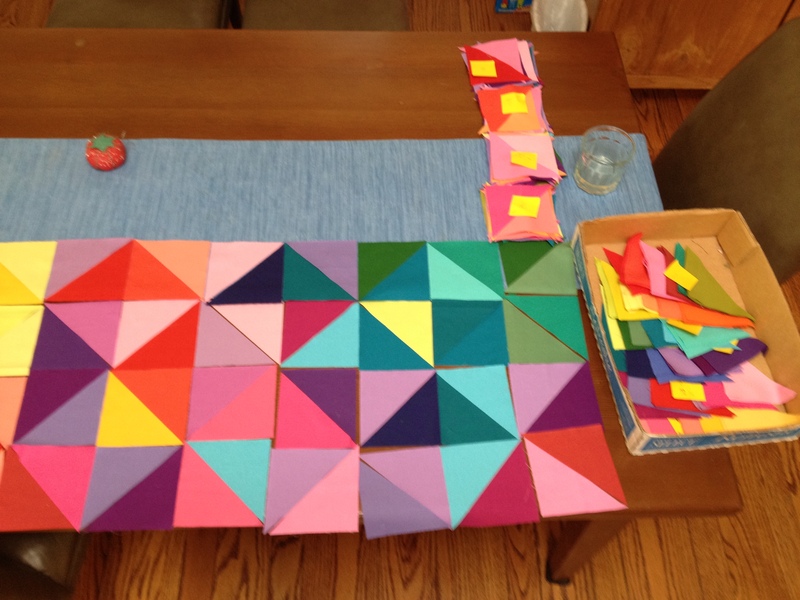 Also laying out all my triangles, in a box, in numerical order, helped too. This is a quick quilt top to make, once you get it all laid out. Just 180 5″ HST. Im linking up with Judy at Patchwork Times and Pink Doxies Pink Doxies this week. Your quilt top is really beautiful. I know you must be excited to have it all put together. 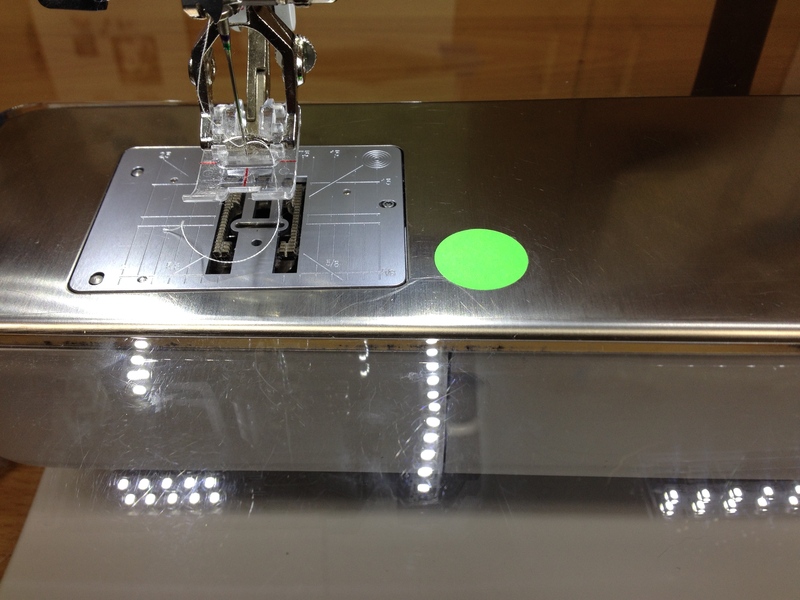 I love the green dot on the machine bed. What a great way to prevent another mishap. 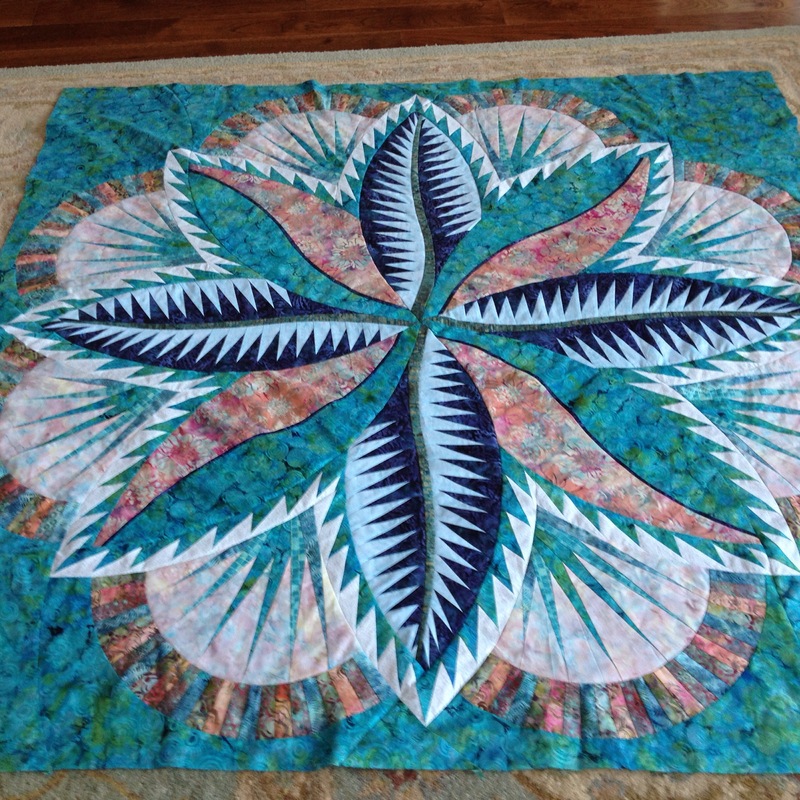 Thanks for the compliment, it does feel good to have it all together and ready to quilt. 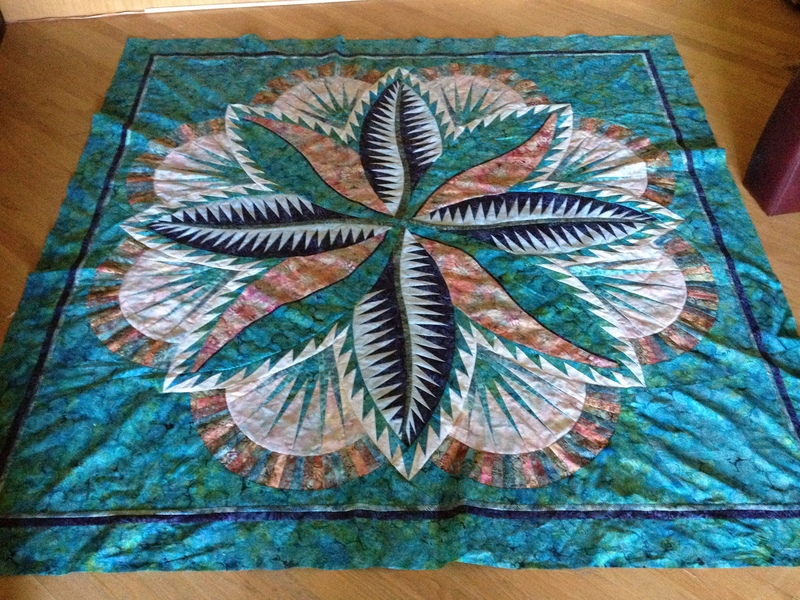 Your quilt top is stunning! I don’t blame you for taking the machine straight to have it seen to. Thank goodness the pin was easily taken out. I look forward to seeing more of your kona project.